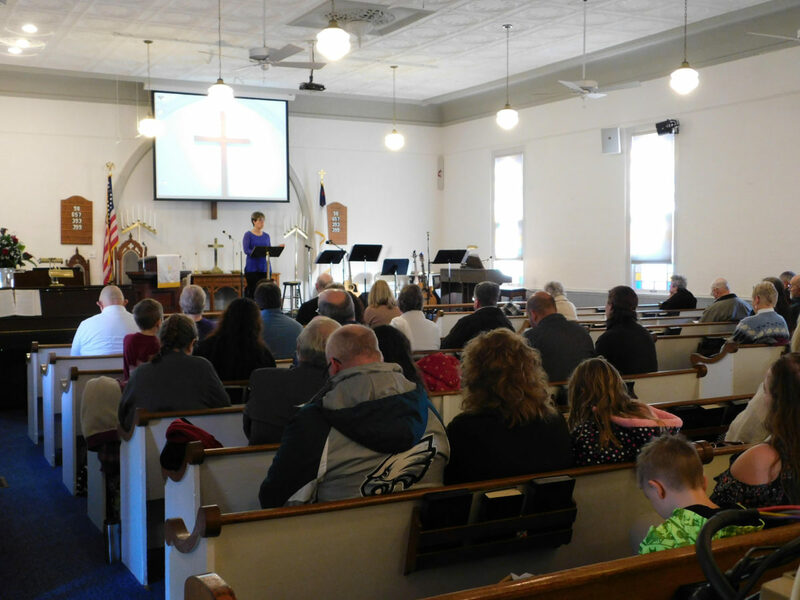 Welcome to Moore’s Chapel United Methodist Church in Elkton, MD! We’re glad you’re visiting. We are an “inter-generational” church, from the little ones, to the seniors, and everyone in-between. There are no perfect people and no perfect churches, so however you show up is fine. We strive to grow in our relationship with God and to reflect God’s goodness to those we meet. Although we’ve been serving Christ for over 145 years, we’re young at heart. We offer both contemporary and traditional worship and a relevant message that will make a difference in your life. Winning the world for Jesus Christ by changing lives through the power of the Holy Spirit. Many thanks to all that attended our Victory in Jesus Kingdom Revival Event! Even during some questionable weather, people were faithful and came out to hear about how we can have revival in our lives and the lives of those around us through the power of Jesus! Thanks so much to everyone who assisted with making this happen. A special thanks to our guest speaker, Rob McCorkle, for an awesome event. For more information about Rob and Cindy’s ministry, click here. More to come, and pictures will be posted in the coming days. Praise God! Ever wonder about who Jesus really is? 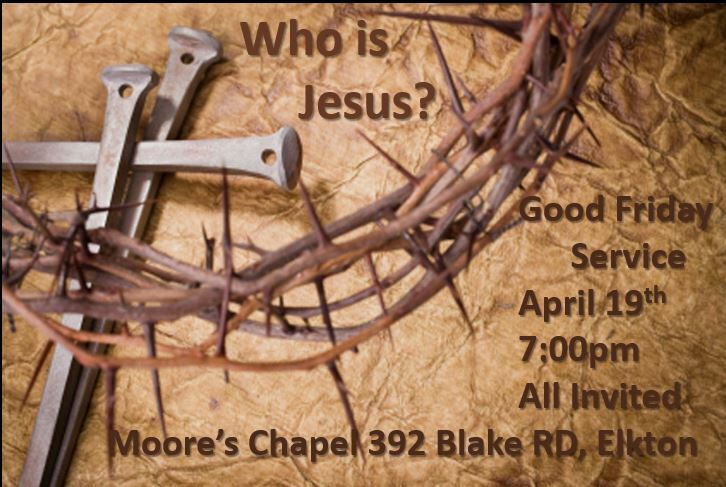 Come to Moore’s Chapel for a special Good Friday service. You don’t need to have it all figured out, just come as you are. Whether you’re new to Christianity, have been walking with Jesus for some time, or are just checking into this “faith” thing, everyone is welcome. 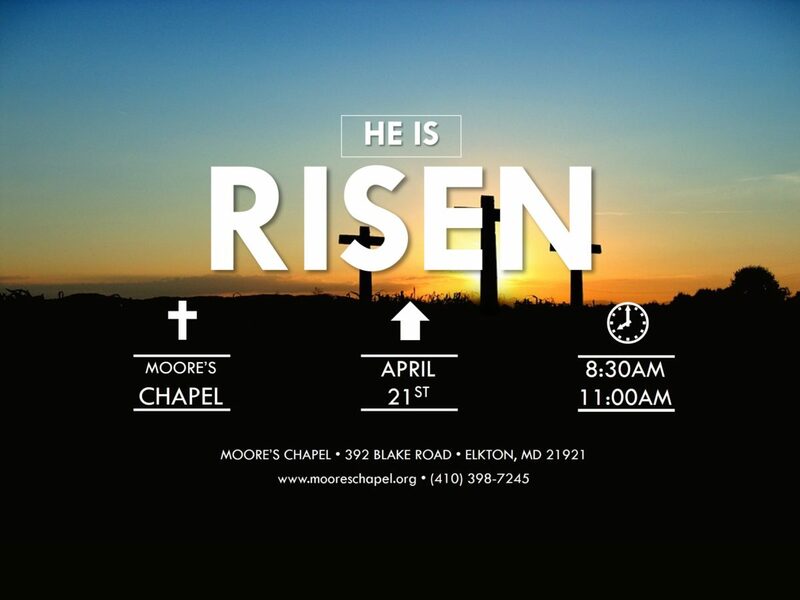 Come join us to celebrate our risen Lord this coming Easter Sunday! We’d love to have you come worship with us. Fast Track Old Testament Study Guide is $20. Each participant needs a Study Guide, a Bible, and a willingness to grow and learn together.